Wot? 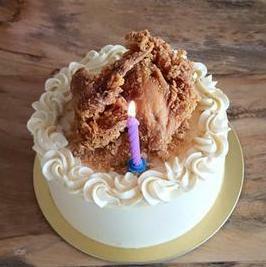 Fried Chicken Cake? Yep, you read it right. This sweet cornbread cake is frosted with brown butter frosting and topped with sweet salty crumble. This cake is best eaten with fried chicken (not included but seriously, really highly recommended), which should be cooled to room temperature before placing on the cake. It's pretty rich so you can share this 7-inch cake among more people. Just don't tell your cardiologist! Note: Words cannot be written on this cake. We can write them on the cake board, if you require them. Please write your message in the remarks section when placing an order. Thank you!